The answer to storing your children’s paintings. As it’s the end of the school year, your little darlings will be coming home from school and nursery with a higher influx of paintings and drawings. Your walls and notice boards cannot cope with the overload so we have the answer! A storage frame to hold up to 50 paintings – Yes 50 paintings and drawings! We would like to introduce a range of patented Front-Opening Wooden Storage Frames, from Dynamic Frames. 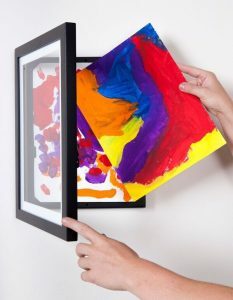 MyLittleDavinci by Dynamic Frames is a front-opening storage frame for up to 50 paintings, certificates, or other documents. It is available in black, white or natural wood. These A4 and A3-sized frames have been incredibly successful online and in Europe.